Commuter Chan: To die by your side, well the pleasure the privilege is mine. To die by your side, well the pleasure the privilege is mine. when I take Charlie for a haircut. Every Saturday I get to shun the NJ Transit rail system and enjoy a blissful 40 minute commute in my car. No one shoves me or shoulder checks me as I am about to get in the door. There are no strangers in my car who cough or sneeze or pick their noses next to me. My husband does all of these things, but at least he has the courtesy to warn me and roll down the window when he farts. This little bit of solitude - it’s like a little piece of heaven that makes it worth the odd Tuesday-Saturday work-week. My only real complaint is the appalling lack of decent radio stations in the New York area. You basically have a choice of Top 40 Crap, Easy Listening Top 40 Crap, House Music Crap, or NPR. Now don’t get me wrong, I love me some NPR. But sometimes I just want to listen to some good old fashioned rock music written post-1960. Recently New York got a real alt-rock station when K-Rock folded and was turned into The Worst Radio Station Ever. Go ahead and tune to 92.3, but I will not be held responsible for your brain leaking out of your head or any associated dry cleaning costs. And while WRXP still plays the occasional Staind single (How the hell DID we wind up like this?) 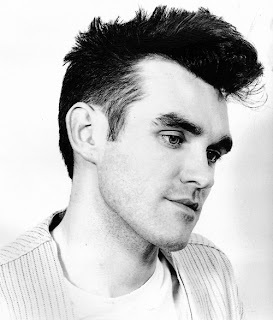 I can forgive them for it when I hear Morrissey reminding me that he is human and he needs to be loved. Just like anybody else does. *No offense to all you Staind fans – I know you’re just too stupid and uncultured to know any better.